What do economic growth, global competitive advantage, technological innovation, and high quality of life have in common? None of these would be possible without the manufacturing sector. As much as we like to say manufacturing is on the wane in the developed world, with the Internet of Things (IoT), there’s actually been a resurgence in this sector, albeit perhaps on a smaller scale. Manufacturing is the driving force behind the steady economic growth, competitive advantage, innovation and high quality of life present in the United States. It has played a key role in shaping and developing the U.S. economy throughout the history of the nation, especially after the start of the Industrial Revolution in the late 1700’s. Simply defined, manufacturing is the process of transforming raw materials into new products, using mechanical, physical or chemical means. Without it, we wouldn’t have the tools and technologies needed to be productive in the other sectors of our economy, nor would we have the various goods that consumers use every day. For example, let’s say that it’s a beautiful Sunday morning, and you have plans to play a round of golf with a friend. In order for that to be possible, a manufacturer needed to forge the club shaft and cut it to the proper length. A separate company, specializing in rubber compounds, would need to create the grip. Someone else would produce the club heads, which rely heavily on manufacturing and design advantages to increase performance. Finally, a technically skilled workforce needs to put it all together. Of course, you won’t be going anywhere without a car, which requires a whole separate chain of manufacturing events! Sectors such as agriculture, construction and health care also rely heavily on the machinery and tools produced by manufacturers. And as for the health of the U.S. economy itself? Economists agree that the U.S. wouldn’t be the powerhouse of a country that is it today if not for the manufacturing sector. In fact, without diving into the nitty gritty details, it can be difficult to put into perspective exactly how much of a lasting impact manufacturing has had on the U.S. economy over time. But hey, don’t take our word for it! 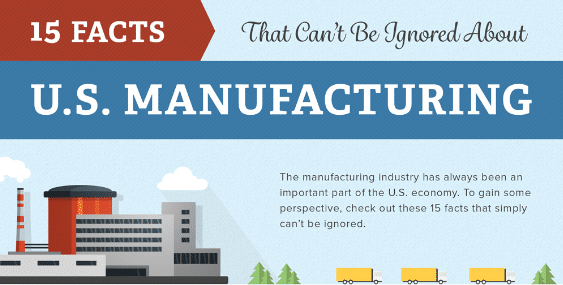 Check out these 15 facts about U.S. manufacturing that simply can’t be ignored, and draw your own conclusions. 1. 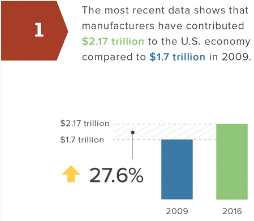 The most recent data shows that manufacturers have contributed $2.17 trillion to the U.S. economy, compared to $1.7 trillion in 2009. While this data tells us a number of things about the U.S. manufacturing sector, perhaps the most noteworthy is that manufacturing is experiencing an extremely healthy level of growth and development. Following the 2008 recession, the entire U.S. economy–including manufacturing–experienced a lull in production and profitability. Recovery was slow the following year, and has remained slow for certain industries. The good news? As long as manufacturing remains strong and on the rise, it can continue to contribute positively to the economy overall, and to play a supporting role for the other sectors that haven’t quite caught up. That’s because it is directly linked to both overall economic growth and growth associated with nonmanufacturing industries. One of the biggest reasons for this is manufacturing’s high multiplier effect, which we’ll dive into later. 2. 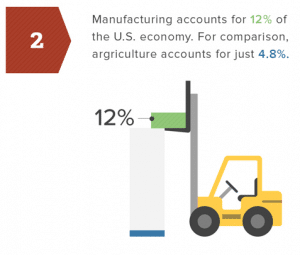 Manufacturing accounts for 12% of the U.S. economy. For comparison, agriculture accounts for just 4.8%. Given that the overall GDP of the United States is $17.419 trillion, and that manufacturing alone contributed $2.17 trillion to that amount, that means it accounts for roughly 12.5% of the U.S. economy. This makes sense, given that GDP is based on the amount of production (i.e. 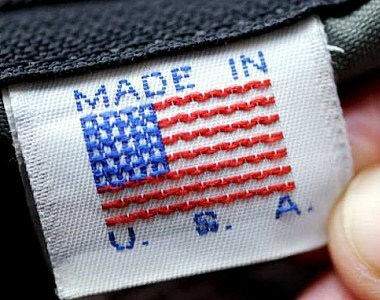 manufacturing) taking place in a given country. As we’ve already discussed, this number is steadily increasing within the sector. That’s a good thing, because more manufacturing means more GDP (which means more total prosperity). According to the USDA, agriculture–which is also considered to be a major industry–has contributed $835 billion to the U.S. GDP. That’s roughly 4.8% of the economy, much less than the figure represented by manufacturing. 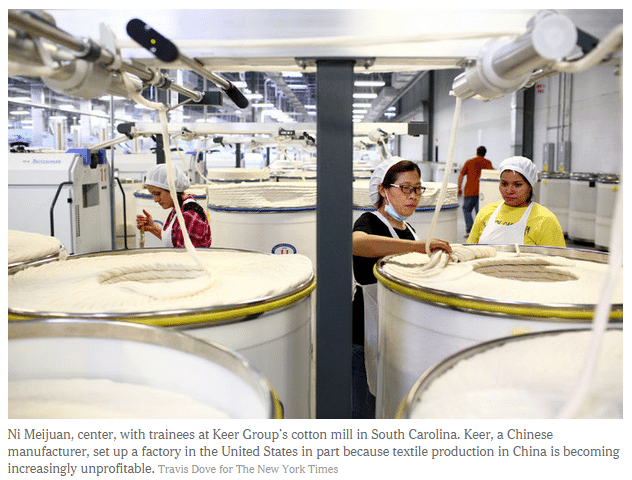 Additionally, large-scale agriculture wouldn’t even be possible without manufacturing! The agriculture sector relies heavily on the machinery produced by manufacturers, including tractors, fertilizer application equipment, and planting and harvesting machinery. 3. For every $1.00 spent in manufacturing, $1.40 is added to the economy. This is the highest multiplier of any sector. The importance of this fact simply can’t be overstated. A strong manufacturing sector is the key to a strong national economy. Why? It is the primary path to development, as both highly developed countries (such as the U.S.) and rapidly developing countries (such as China) have shown. Globally, the U.S. depends on the goods produced by manufacturing to trade with other countries. 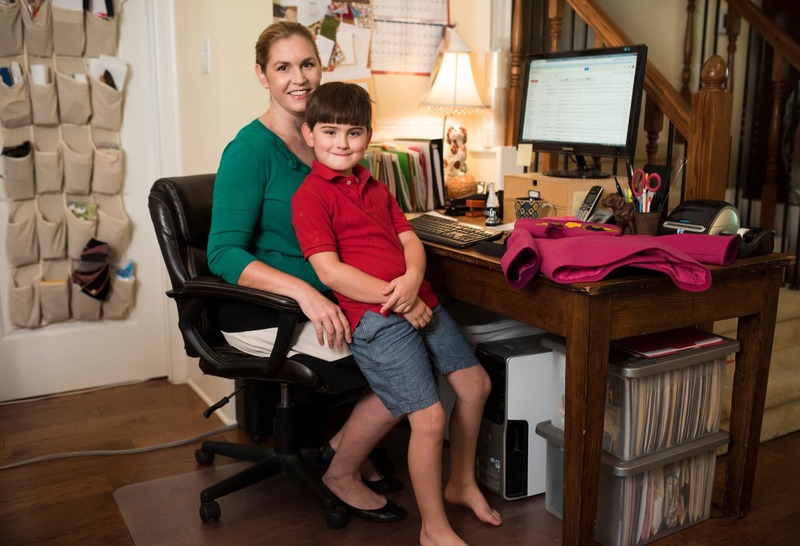 This includes products such as computers, primary metals, and medical equipment. Without having these goods available to trade, our economy would suffer. The fact that manufacturing has the highest multiplier of any U.S. sector shows that we are investing our resources in the right (i.e. most productive and profitable) way. Simply put, the more money we put into manufacturing, the more return on investment we’ll see in our economy. 4. 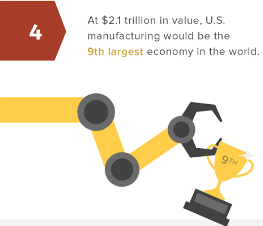 At $2.1 trillion in value, U.S. manufacturing would be the 9th largest economy in the world. Of the 247 countries ranked in terms of GDP by the World Bank, the U.S. manufacturing sector would come in at number 9 on the list if it were its own country. Outranked only by the GDPs of the United States, China, Japan, Germany, the U.K., France, Brazil, and Italy, U.S. manufacturing GDP tops that of many powerhouse countries such as India, Canada, and Australia. That’s a lot of power for just one sector of one economy! This is important, because a high GDP is typically linked to positive features such as low unemployment, increased demand, and greater profitability for businesses and investors. 5. 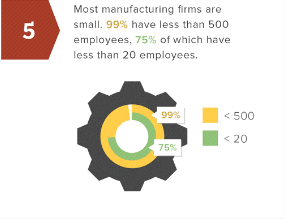 Most manufacturing firms are small. 99% have less than 500 employees, 75% of which have less than 20 employees. Why does this matter? Small firms contribute to the local economy and community where the business is established by creating job opportunities and growth. They also contribute to the greater national economy by creating employment opportunities for individuals who may not be able to work at a larger firm, due to location restrictions, work style preferences, or other factors. Additionally, it’s safe to assume that each firm has its own unique systems, ideas, goals, and workplace environments. That also means they have their own ways of approaching efficiency, quality, and safety. In other words, a large number of small firms generate more diversity in processes and ideas than a small number of large firms. This diversity lends itself to innovation, which is a superb outcome for both the manufacturing sector and the U.S. economy as a whole. 6. 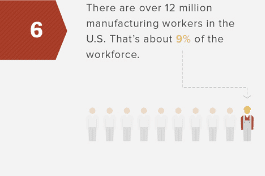 There are over 12 million manufacturing workers in the U.S. That’s about 9% of the workforce. Following the 2008 recession, employment numbers across all sectors dropped dramatically. As with other industries, manufacturing was hit hard and experienced a drop in employment. Despite this, manufacturing remains one of the largest industries in terms of number of workers. This data showcases the hardiness and resilience of the manufacturing sector, and confirms the importance of it in terms of overall employment opportunities. These figures are especially impressive when you consider the diversity in education levels and skill sets among manufacturing workers, from unskilled to highly skilled laborers. Additionally, according to the Economic Policy Institute, each manufacturing job supports nearly three other jobs in the economy. In this sense, those 12 million manufacturing jobs are actually supporting a huge portion of the total U.S. workforce. For example, let’s say a manufacturer produces an automobile engine. 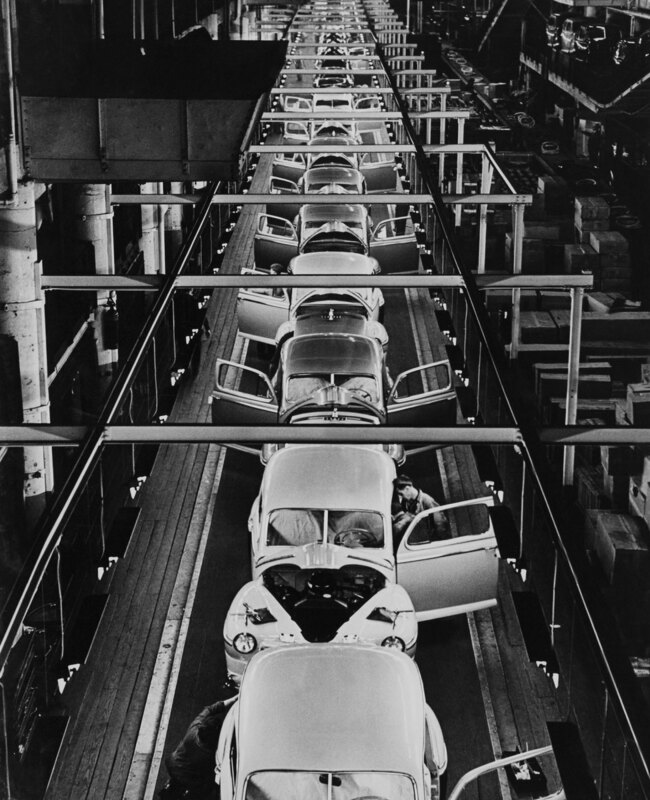 A separate factory worker would be needed to assemble the automobile using that engine. Then, a salesperson would be able to sell that car to a consumer or business. If the buyer of that car is a taxi or Uber driver, that’s yet another job that wouldn’t exist without that manufactured engine. 7. 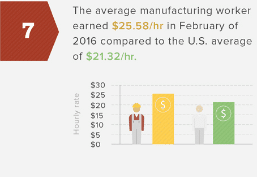 The average worker earned $25.58/hour in February of 2016 compared to the U.S. average of $21.32/hour. As we’ve seen, those 12 million U.S. workers play a huge role in shaping the GDP and economic health of the nation. They are one of the biggest driving forces of wealth and development, meaning it is absolutely vital to keep that talent pool fresh and thriving. The truth is, minimum wage earnings just don’t cut it these days, in terms of both attracting valuable workers or providing adequate financial support. Manufacturing is one of the largest employers of workers without college degrees, and by providing them with livable wages and meaningful jobs, the manufacturing industry is helping to build a healthy middle class. This means more disposable income and purchasing power for a greater number of U.S. citizens, which in turn means good things for the national economy. 8. 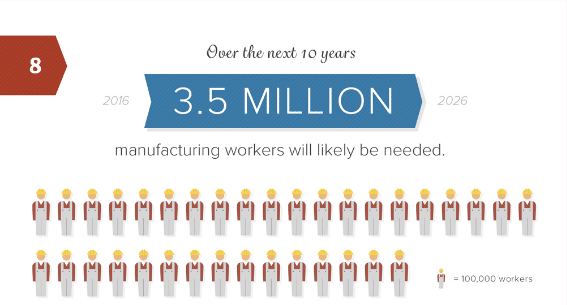 Over the next 10 years, 3.5 million manufacturing workers will likely be needed. Despite the fact that manufacturing workers are compensated at above average rates for their work, some firms are still unable to fill job openings with skilled, qualified workers at a fast enough pace. While 3.5 million new manufacturing jobs are expected to open up over the next 10 years, a whopping 2 million of those jobs are expected to remain unfilled. Even today, manufacturers are finding it difficult to hire the number of skilled employees necessary for keeping up with the ever-increasing demand for manufactured goods. In fact, 80% currently say that they have a shortage of qualified workers applying for skilled and highly skilled manufacturing roles. To combat this deficit, it’s critical for manufacturing firms to offer increasingly competitive compensation, formal company-funded training, and other benefits. If these workforce statistics do not improve, it could prove detrimental to the future of U.S. economic growth. 9. 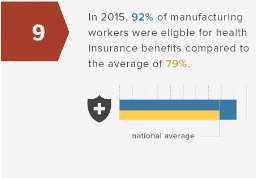 In 2015, 92% of manufacturing workers were eligible for health insurance benefits compared to the average of 79%. While higher-than-average compensation is certainly a big draw for many manufacturing workers, other benefits such as health coverage can be equally as important. Health care and hospital bills have been known to bankrupt entire families, making dealing with illnesses and injuries an extremely stressful experience. By offering employees valuable health insurance benefits, firms can continue to attract top talent by offering a level of protection that’s sought-after by many workers, keeping the sector strong in the process. This is just one of the steps that manufacturing firms are taking to fill their job vacancies with highly skilled workers. 10. 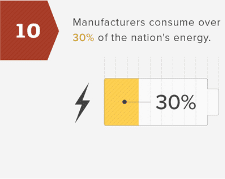 Manufacturers consume over 30% of the nation’s energy. While this may sound like a fairly straightforward fact, this is actually the point where things get complicated. Overall, manufacturing uses more than 30% of the nation’s energy. 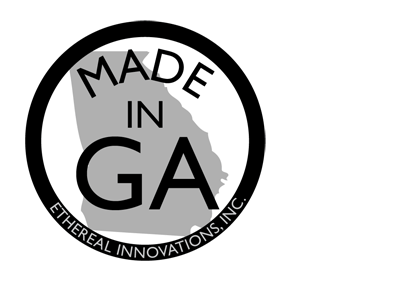 While it varies based on what exactly is being manufactured, natural gas and electricity tend to be the primary energy sources used by manufacturing. However, energy sources are only available for use because of manufacturing. Without plants that produce oil-drilling and other power-generating machinery, it would be impossible to harness and use energy. Ironically, the petroleum industry–a nonmanufacturing field which provides energy–is the single largest industrial consumer of energy. In turn, the petroleum industry also generates 92% of the energy used by the transportation sector. Talk about a mind-boggling chain of events! It’s a complicated network of relationships, but what it boils down to is this: it takes energy to make energy, and in many cases, the energy consumed by the sector is being used to produce new energy-generating equipment. And–you guessed it–this machinery is becoming more and more innovative and efficient every year, thanks to manufacturing. This includes clean energy equipment such as wind turbines. 11. The output of the U.S. manufacturing industry is higher than ever before, even though employment has hardly recovered since 2010. We know what you’re thinking–how is it possible that the sector itself is still standing strong, even when manufacturing employment has fallen flat? The short and simple answer is this: these days, manufacturers are more productive than ever, thanks to rapidly advancing technologies and processes. Manufacturing firms are learning to create more output with less input, becoming leaner and more globally competitive in the process. 12. 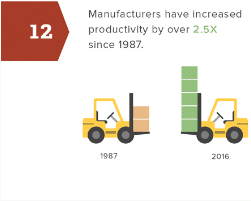 Manufacturers have increased productivity by over 2.5x since 1987. For comparison’s sake, the overall increase in productivity for non-farm businesses during this same timeframe was 1.7x, meaning that manufacturing is becoming productive at a significantly faster pace than the national average. Manufacturers are approaching increased productivity from a number of perspectives, all of which generate positive productivity results. 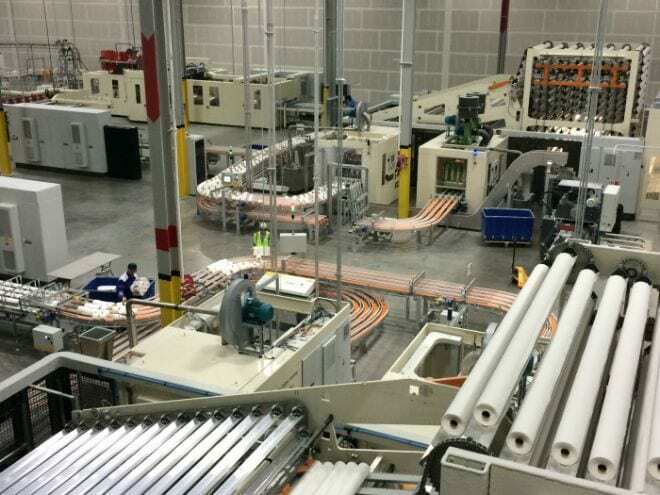 Machine down-time and malfunctions, bottlenecks, and human error are all obstacles that manufacturers are learning to overcome bit by bit, leading to greater efficiency and minimized costs. Higher productivity also means a greater global competitive advantage, trading and buying power, and GDP potential. Win-win! 13. Over 75% of all private sector research and development is driven by manufacturers. There’s a constant push for manufacturers to update and improve their processes in terms of efficiency, quality, speed, safety, and cost. Consequently, manufacturers drive more innovation through research and development than any other sector. 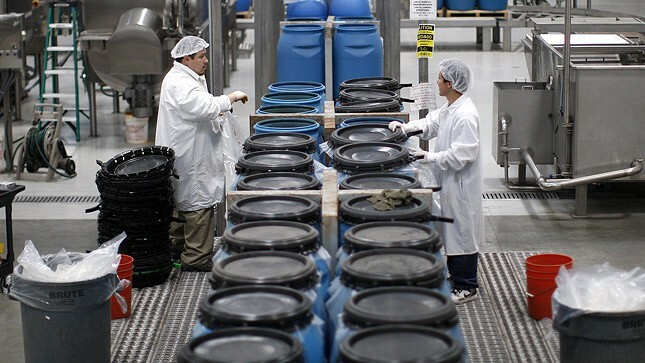 Increased innovation and productivity created by manufacturing can generate more efficient processes at cheaper costs, more effective technologies, and better quality goods for both U.S. consumers and other industries. Pharmaceuticals, chemicals, aerospace, automobiles, computers, and electronics are some of the largest contributors to R&D spending within the sector. Advancements in these fields can greatly improve the quality of life for the Americans who use these goods and services. Additionally, many researchers agree that technology tends to increase at an exponential rate, meaning that each and every advancement in technology paves the way for future development. 14. Orders for durable goods and capital goods rose 4.9% and 3.9% respectively, in January 2016. While all sectors and industries benefit from increased research, development, and innovation driven by manufacturing, perhaps the field that gains the most is manufacturing itself! R&D not only improves the quality of consumer goods, but also that of the capital inputs used to produce those goods. Loosely defined, capital goods are products of manufacturing that are used in the production of other goods. This includes tools, technology, and equipment. It’s not surprising, then, that orders for capital goods increased by 3.9% in January 2016 alone. Capital goods are essentially an investment in the future, making them key to growth and development. Durable goods also saw a positive spike in orders in January, with a 4.9% increase. Durable goods are consumer goods which do not need to be purchased frequently, such as cars and appliances. As these types of manufactured items continue to improve in quality and longevity, they become more valuable and desirable to consumers. 15. Many manufacturing companies factor their receivables to improve cash flow and expand business. Factoring is a method of business funding in which a firm sells its accounts receivable to a third party agent at a discount. This method is ideal for boosting cash at hand without incurring significant debt risks. It’s a popular option for manufacturers, who may see large inconsistencies in available cash based on their production cycles. By securing additional cash, manufacturers are free to make valuable investments and improvements in their machinery, workforce, and processes. By using manufacturing invoice factoring to secure funding, manufacturers are putting stock in their own future value and finding ways to expand their businesses at a faster rate. Manufacturing has long been the heart and soul of the U.S. economy, and despite a number of recent economic setbacks, it continues to remain steady and to generate substantial growth and innovation. The benefits of manufacturing are visible at every level of the U.S. economy, from individuals to communities, and from businesses to entire industries. As these 15 facts display, it is vital that we continue to supply the manufacturing industry with a consistent stream of financial, capital, and human investments, in order to preserve our strength and prosperity as a nation. What’s So Great About Manufacturing? 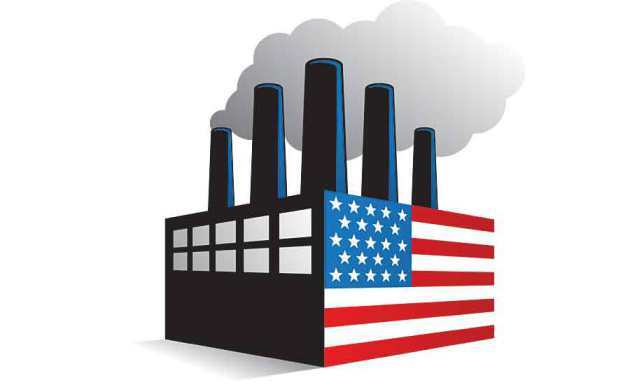 https://www.themadeinamericamovement.com/wp-content/uploads/2015/08/08-11-15-New-Yorker-Whats-so-great-about-manufacturing.jpg 1200 975 The Made in America Movement Team https://www.themadeinamericamovement.com/wp-content/uploads/2017/08/Made-in-America-Movement-Logo_340x156.png The Made in America Movement Team2015-08-11 12:15:222016-01-27 17:48:40What’s So Great About Manufacturing?